Despite legal initiatives and public education campaigns, drunk driving remains a serious problem in the United States. In 2008, more than 1.4 million people were arrested for DUI, but that figure represents less than 1 percent of the self-reported incidents of alcohol-impaired driving, according to the Centers for Disease Control and Prevention. In 2008, 11,773 people were killed in alcohol-related crashes, equating to one death every 45 minutes. Before getting behind the wheel after having a few, consider the many reasons why you should not. Drunken-driving laws vary from state to state, but driving with a blood-alcohol concentration of 0.08 percent or greater is illegal in all 50 states. Additionally, zero-tolerance laws make it illegal for people younger than 21 to be caught with any reading other than 0 on the breathalyzer test. In 41 states, administrative driver's license suspension is required for people who receive a DUI, according to the Insurance Institute for Highway Safety. Additionally, more than half the states require people who receive a DUI to install an ignition interlock device on their vehicles for a designated period before their licenses can be reinstated. This is in addition to the fines and court costs that will be assessed to people convicted of drinking and driving. Alcohol impairs your motor skills, meaning you won't be as good of a driver drunk as you are sober. For example, visual acuity is reduced by 32 percent when you are drunk, and peripheral vision is affected as well, according to the University of Texas at San Antonio. Distance and depth perception are also affected, and people who are drunk also do not hear as precisely as when they are sober. Alcohol acts as a depressant on the central nervous system. Because of this, it can significantly impair your judgment and reaction time—a bad combination when you are behind the wheel. In fact, people who have been drinking can respond between 15 percent and 25 percent slower than when they have not been drinking, according to the University of Texas at San Antonio. 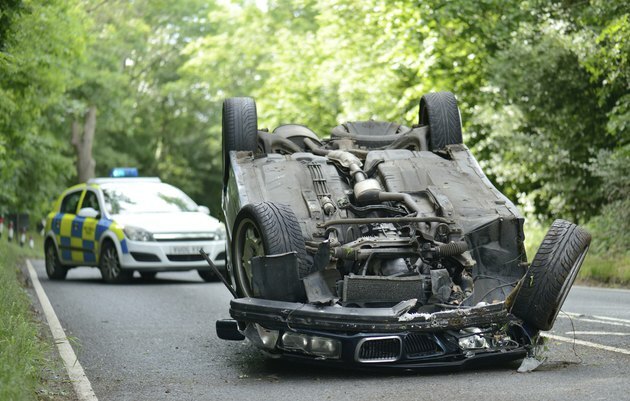 This slowed reaction time is often the cause of drunken driving accidents. Judgment is also quickly affected by alcohol. Even a blood-alcohol concentration of 0.02 percent can impair a person's judgment. Drunken driving takes a large toll on society in general. In 2000, alcohol-related crashes in the United States cost Americans more than $114 billion dollars, according to Mothers Against Drunk Driving. That figure includes more than $51 billion in monetary losses and more than $63 billion in loses related to quality of life. If the above reasons are not enough to think twice before driving after having a few drinks, ask yourself if you will be able to live with the guilt if someone is injured or killed because of your reckless actions. Of the 11,773 alcohol-related traffic deaths in 2008, 216 were innocent children who were 14 or younger, according to the CDC. Every day, innocent people have their lives destroyed by people who decided they were OK to drive when in fact they were not. Keep that in mind next time you decide to get behind the wheel.